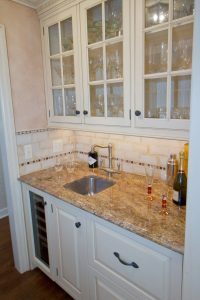 This home bar is a treat for wine lovers! It brings a wine system, along with ample work space into a beautiful and inviting social space between the kitchen and the family room. Home bars are becoming increasingly popular, and can be added to fit your style and living space.